Customer experience (CX) is the new battlefield on which enterprises must fight in order to remain competitive. However, organizations continue to underestimate the challenge setting up a CX management strategy, plan and infrastructure represents. The goal is to reach a Federated CX model – one in which CX is “woven into the fabric” of the entire organization’s people, processes and technologies. 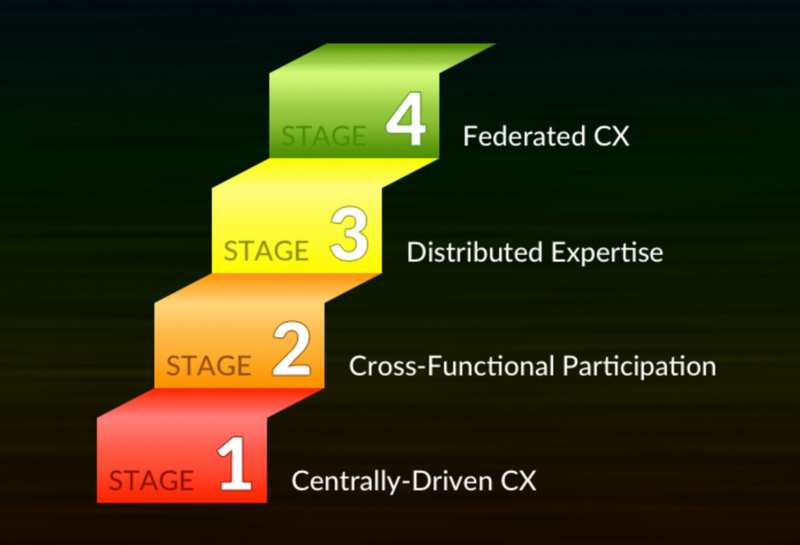 Too many organizations are stuck at Stage 1, a centrally-driven CX management (or CXM) model, which unfortunately results in the formation of yet another silo (CX in silo, whodathunkit?) – the exact opposite of what you want. For CXM to be effective, it absolutely must involve the entire organization. CX is everyone’s job, and no single group of people, no discrete workflow, no single technology solution can accomplish it alone. It’s natural to start with a designated person or group to champion the CX effort and give them the budget and resources to get started. But you can’t stop there. It’s not a problem that can be solved with a weekend retreat and a tech purchase. It’s an ongoing process and a massive organization-wide commitment. Here are some common pitfalls organizations encounter during the complex process of achieving CX maturation. CXM is a complex, ongoing, iterative process and a significant investment. Your CX strategy and execution will have to continually evolve with your customers’ expectations and changing technologies. In his recent report “Your Digital Experience Technology Strategy Starts with a Customer Journey Map,” Forrester analyst Ted Schadler recommends starting with extensive strategy work before you even make your CX plan, much less start buying technology or allocating people or defining processes. Schadler emphasizes the need to understand – really, deeply know – your customers’ journeys with your company or brand, at every touchpoint and through any channel they might choose before making any changes or investments. Schadler says digital experience strategy shapes the technology you need and he cautions that it’s a long-term process that can take five years and cost millions of dollars. But it’s critical to have a plan and a reason for every decision you make during that process. You simply cannot buy a bunch of one-off solutions without forethought, try to cobble them together, and expect good results with an architecture this complex. That leads to the second major pitfall and the challenge of prioritizing CX tactics. There are literally thousands of software tools out there that are aimed at solving one or more problems in CX management, and more are being created every single day. Scott Brinker estimates there are 3,500 vendors in the martech space alone, and he says many enterprises are running 20 or more marketing applications at a time. That doesn’t even count the CX-related applications running in the commerce and service sides of the house. Making tech purchasing decisions can be overwhelming, particularly in terms of integration -- sharing content, data and assets across applications and departments. How do you know what to keep and what to get rid of? How do you decide what’s a good investment for the future? It all goes back to your CX strategy and understanding your customer’s journey. If you don’t understand where you’re strong and weak from the perspective of the customer, you’re likely going to waste money. Period. If you can’t integrate a piece of software into your broader CX architecture, you don’t want it. It won’t be serving the customer’s needs if it isn’t working well with the rest of your platform. Choose thoughtfully, with a long-term integration plan in place, to keep your CX infrastructure flexible enough to grow and scale with your business and customer’s needs. Again, CX is everyone’s problem and everyone’s responsibility. Every department and process and workflow and application should serve CX in some direct or indirect way — or at least not get in the way of good CX. In the vast majority of organizations, Marketing owns CX. Gartner research indicates that marketing departments carry the largest budget burden for CX tech and initiatives. But marketing only owns about one third of the CX pie and needs to be balanced with commerce and service to give customers a consistent, high-quality experience at every stage of their journey with your brand. This is why Temkin’s federated approach to CXM makes the most sense. Just like the U.S. federal government’s relationship with the states, there must be a fair balance of duties, responsibilities and spending – with central, unified guidance but distributed execution -- to achieve the common good. Finally, many organizations fall into the trap of thinking that going to the cloud or adopting SaaS solutions will solve all their CX integration problems. Sadly, this is not the case. As we’ve said before, integration problems still exist – they’re just outside the firewall now. Focus as much or more on a SaaS app’s integratability as you do on whatever nifty features it offers. If you can’t integrate it with the rest of your DX platform and your people can’t or won’t use it, it’s ultimately a waste of money. DX software must be able to share content and customer data to work well as part of your overall CX architecture. That has to be a priority, or you’ll spend all your time and resources just trying to get things to work together rather than focusing on your customers like you should. We’ll be discussing each of these pitfalls in more detail in upcoming blog posts, so be sure to subscribe to our blog using the form at the top of our main blog page for more great content like this.